London Film Festival was home to many beautiful movies this year but perhaps coming in at my favourite was Melissa McCarthy in Marielle Heller's Can You Ever Forgive Me, an adaptation of Lee Israel's memoirs of the same title. 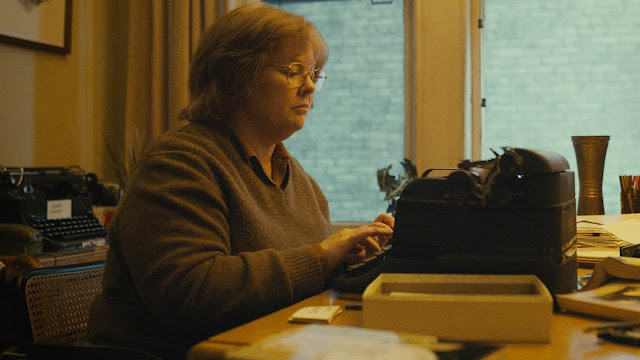 It follows her through a period of financial struggle, turning to forging letters from some of the literary greats in order to sell them for cash. The film was littered with great performances, from that of McCarthy herself to Richard E Grant playing her closest friend of the time, Jack Hock. Every ounce of anxiety fuelled into McCarthy's performance was transferred so perfectly onto the audience. I couldn't imagine anybody else playing the role of Lee Israel, she was every inch the part. The comedy flowed perfectly inside of what seems to be on the surface, a dramatic narrative. It never cheapened the script, it just allowed us to see inside her reasoning and made her more likeable outside her very antisocial behaviours. The narrative is almost like a letter itself, a letter to that of being lonely. I'm always amazed by how I never get sick of seeing Manhattan on screen. It's such a lived in city and you can scour every inch of every block to pull a new insightful narrative out of it. You feel her doing something so secretive in a city so big and you feel how isolating it is in doing so, which is where the relief of the shared blame with Richard E. Grant's character is such a great factor in the narrative. They're both lost and they get to find solace in each other, it's a beautiful relationship to watch develop. A real lived in friendship. There's one scene that's still on my mind, it's actually the first in the trailer. Lee has gone to sell some books in a local shop to get money to pay for her cat's vet bill. Now, as a writer, I imagine her books to be some of her favourite items and yet she so willingly tries to hand them over, simply to pay for a vet bill. It's touches like that which will seem cliché but it's where the truth is since it's how Lee started her forgeries. There's so much humanity in that one moment, wanting so desperately to just survive outside of the stereotypical 'writer' tropes of cynicism and isolation, she didn't just look her cat in the eye and say 'well, kid, it's been real' she did what she had to do and from there realised that her life could be easier. "I can't say that I regret any of my actions, in many ways, this has been the best time of my life"
is one of my favourite quotes from the film. We spend 106 minutes with Lee, we know her anxiety has been through hell and back to maintain this lie and yet she remains unapologetic, intelligent and witty even amidst what's supposed to be her testimony. I do not know how true to life this quote may be but I want to see more women like this on the screen in 2019. Can You Ever Forgive Me is out in UK Cinemas from February 1st 2019.